Getting consistent, quality sleep on a regular basis is one of the most basic and healthy tips for weight management, mental health, and overall quality of life. 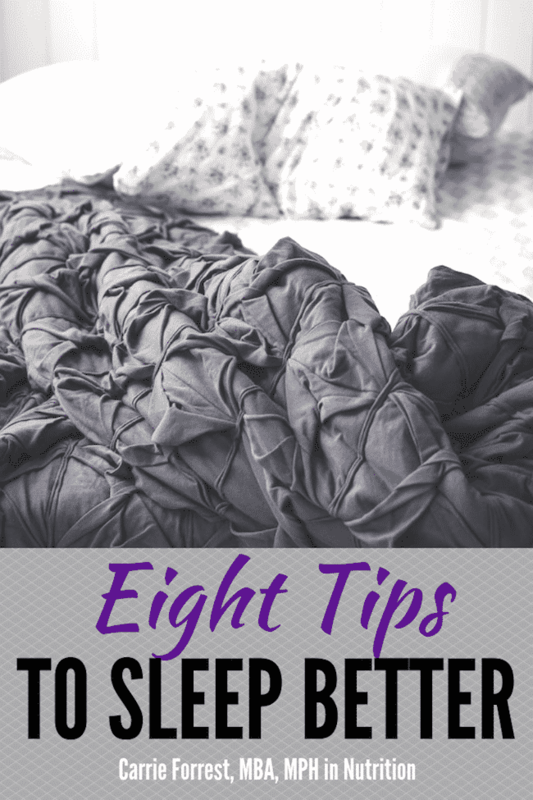 This post includes eight ways to sleep better. It doesn’t seem like it should be that hard to get good sleep, but our modern lifestyle combined with other factors have made it harder and harder to avoid sleep problems. Americans have been sleeping less over the years, and more people than ever are reporting sleep difficulties. It’s easy to understand why prescription sleep drugs were developed and why patients want to get their hands on them, but there are numerous studies that show prescription sleep drugs are counter-effective for getting good sleep, promote dependence, and have serious risks, including overmedication. Not only that, but if zolpidem (the drug used in Ambien and other prescription sleep medications) is combined with alcohol or other prescription drugs, there can be serious adverse consequences. One study even showed an increased risk of mortality with the use of sleep medications! While our modern lifestyles with artificial lighting, over-stimulation, and chronic stress don’t promote good sleep quality, the bottom line is that it is possible to use natural remedies to sleep better and avoid the risks associated with prescription sleep medication. Here are eight healthy sleep hacks for how to sleep better. 1. Get morning bright light to balance circadian rhythms and prevent seasonal affective disorder. With the shorter days and potentially gloomy winter skies ahead, now is the time to get in the habit of exposing yourself to bright morning light. At least one study has shown this to be an effective strategy for both better circadian rhythm and to prevent seasonal affective disorder (winter depression). Even walking outside in the morning on a cloudy day is better than not, or you can buy a special lamp to sit in front of for 30 minutes in the morning. 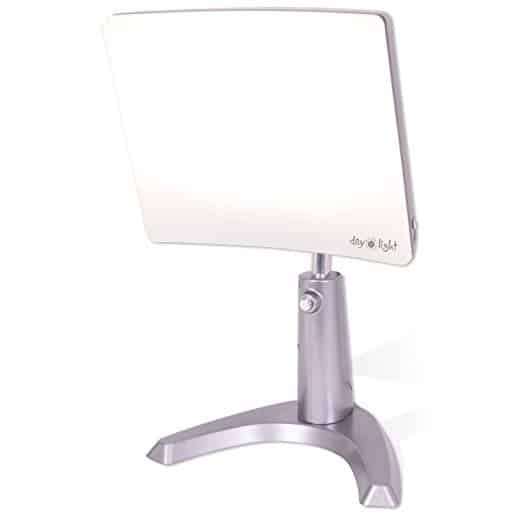 I have a bright light therapeutic desk lamp similar to this one. 2. Use blue-light blocking glasses after dusk. A study published in 2017 showed some benefit in sleep quality for blue-blocking glasses worn at night for people with depression who also suffered from insomnia. 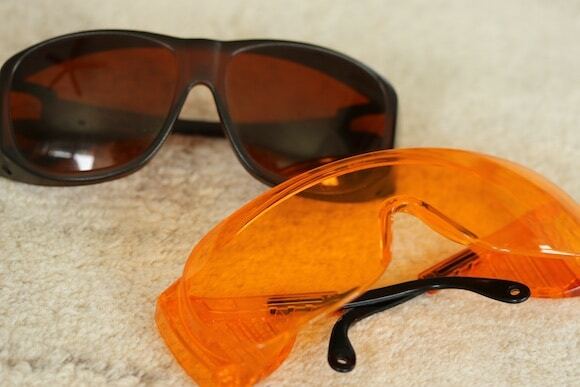 Be sure to get blue light-blocking glasses that are comfortable and that you don’t mind wearing! I have prescription glasses for near-sightedness, so I got these amber glasses that fit over my regular glasses I wear after I take out my contact lenses. 3. Take a relaxing bath a few hours before bedtime, or just warm your feet! Studies have shown that it’s helpful to warm the body (or just your feet) before bedtime, or a few hours before. Not only does the change in body temperature induce sleep, but a warm bath also helps promote general relaxation. 4. Get a massage or practice self-massage to promote relaxation. Massage has so many benefits in general, but a gentle massage a few hours before bedtime can actually improve sleep quality, too. At least one study using patients who recently had surgery shows that because massage can reduce pain, then it can also improve sleep. This brings up a good point that it’s important to address any ongoing pain issues if you’re suffering from insomnia. I like to use this handheld self-massager to get out the knots in my neck before bedtime. CBD has been shown to reduce anxiety and promote relaxation, which helps with sleep. You can read more about what CBD is and how it works in this article about CBD oil and anxiety, insomnia, and pain. I use and recommend these CBD Sleeping Pills by Medterra for a THC-free option, legal in all 50 states! Use code CLEANEATING for 15% off your order! Medterra’s CBD Sleeping Pills contain a THC-free CBD oil along with melatonin, a hormone that helps regulate sleep and acts as an antioxidant. If you already have CBD oil, you can also try my Homemade CBD Sleep Gummies recipe using tart cherry juice, which also helps naturally increase the body’s production of melatonin. 6. Eat one serving of starch with dinner and don’t go to bed hungry. If you find yourself waking up in the middle of the night with a growling, empty stomach, you might need to try eating more complex carbohydrates with starch at dinner. Try adding a serving of rice or potato and see if that helps. Chris Masterjohn, PhD, wrote an interesting article about the reasons why this might help, and Lara Briden, ND, also noted in her book, The Period Repair Manual, that starch can help keep blood sugar stable throughout the night. 7. Be cautious of your nighttime lighting. Studies show that ambient lighting at night can inhibit melatonin production and impair proper sleep cycles. There are several options to prevent this including installing black-out curtains in your bedroom or wearing an eye cover to create complete darkness. I like this type of eye cover that doesn’t press up against my eyelashes. If you’re concerned about falling at night, you can still keep on a nightlight, but do try to cover your eyes to block out any light in your room. 8. Don’t sleep with pets on the bed or with restless partners. This is a tough one because many of us are used to sleeping in the same bed with partners or pets. If you suspect that this might be the reason you’re not sleeping well, then try sleeping apart for a few nights. This doesn’t mean you love your pet or partner less, but you’re putting your health first. If you don’t have an extra bedroom, consider buying two twin mattresses for you and your partner to reduce movement that might wake you up, and do encourage pets to sleep on the floor and not on your bed. I’m no stranger to sleep issues. Hashimoto’s disease, hypothyroidism, PCOS, and stress have caused me to have trouble falling asleep and staying asleep. I know the anxiety associated with not sleeping well, and how horrible it feels to wake up feeling more tired than the night before. I was never prescribed sleep medication nor have I ever requested it, because I have always been too scared of becoming dependent on a prescription sleep drug. But, I sure have been tempted because I know how debilitating it is to not sleep well. 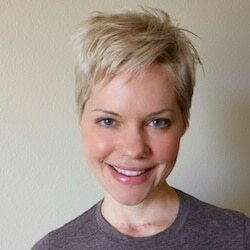 The first few months after I was treated for thyroid cancer, my sleep was the worst it has ever been. I’m pretty sure I had some post-traumatic stress response happening, along with my hormones being all out of whack. I would wake up around 3:30 am and couldn’t go back to sleep. It was truly a nightmare and I can empathize with anyone who is currently dealing with insomnia or ongoing sleep issues. I’ve read all the sleep books and listened to all the experts to come up with the previous eight natural remedies for how to sleep better. 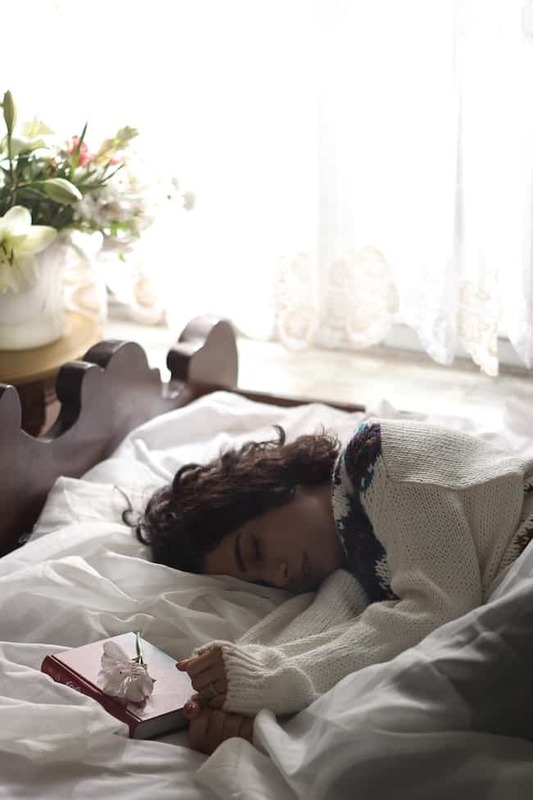 I’m not going to say that I never have sleep issues now, but I sleep well most nights, especially when I practice healthy sleep hygiene and these healthy home remedies for how to sleep better. Do you have sleep problems? What has worked or not worked for you? I have never found anything that helps me sleep (except some very strong herbs and meds that give me wicked hangover). BUT his app I like a lot..enables you to shift your monitor towards amber light, removing some of the intensely pineal disrupting blue light. Free for MAC’s I have been using it nearly 3 years. I’ve heard of this app, Geoffrey, but haven’t used it! Thanks for including the link. The only herb that helps me is passionflower, but I don’t even really need that anymore. Not that my sleep is perfect every night, but it’s gotten SO much better in the last year or so. Have already been through manopause so that’s out 😉 Oh and what fun testosterone/estrogen/thyroid/adrenal dysregulation is! I noticed that when I went camping (on Pismo Beach!!) I slept really well because of all the fresh air. So now I make sure I get fresh air at night by opening my windows when it’s not too cold to do so. I do that too, Stephanie! I was pretty shocked to read that the best temp for sleeping is in the mid-60s. It was so hot when we were in Austin a few weekends ago, but my husband hates sleeping with the A/C on. I think the hotel room was around 73-74 and that made it so hard to sleep. Xo. I am glad I kept my light box I purchased a while back and will use it again I’m sure. I don’t have trouble sleeping now, but did several years ago. I do like to sleep with a lightweight scarf over my eyes. I’ve tried those masks, but they don’t stay on or are uncomfortable, leaving marks. I am lucky that I can sleep in the heat. Noise bothers me but I have ear plugs that I use if needed. I really should get a light box for the winter months. I know it would help me tremendously. I think I’m going to try and join the Healthy blogger book club for next month! I just found the book at the library! I would so love for you to join the book club, Amanda!!! XO. I’m a horrible sleeper and have been since birth. My poor mother! I do sleep with an eye mask and ear plugs, and that helps some. The times I’ve intentionally meditated before bed or have done some simple yoga poses before bed have also helped. I’m just usually in too much of a rush to get to bed…which may be some of the problem!!! Thanks for the tips, especially on the iPhone. I had no idea that existed! Ohhhh, I’m so sorry to hear about your sleep issues, Heather. And, lifelong no less! 🙁 I like your tips, though, and sending you good vibes for restful sleep. XO. Great tips! I’m lucky, I tend to be a pretty great sleeper. Sometimes I go through bouts of insomnia though – it feels like it’s related to my hormones getting out of sync though. I used to have a light box for SAD when I was living in Canada – haven’t had to use one here yet, but I imagine I’ll need one at some point again.